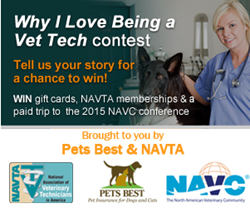 Grand prize winner will receive a paid trip to NAVC Conference. The "Why I Love Being a Vet Tech" Contest by Pets Best and NAVTA will recognize outstanding veterinary technicians across the U.S.
Pets Best Insurance Services, LLC, a leading U.S. pet insurance agency based in Boise, Idaho, announced today it has partnered with the National Association of Veterinary Technicians in America (NAVTA) to host the Why I Love Being a Vet Tech contest. Pets Best and NAVTA developed the contest to recognize the outstanding work of veterinary technicians across the nation. Pets Best and NAVTA invite veterinary technicians to submit short essays explaining how they chose their profession and why they love their work. The finalist who earns the most support in an online vote will win a paid trip to the North American Veterinary Community (NAVC) Conference from Pets Best. Each of the eight finalists will also win $200 and a one-year NAVTA membership. Veterinary technicians can submit entries by visiting http://www.petsbest.com/forms/vet-tech-contest. Submissions should include a short essay of 250 words or less. A judging panel comprised of representatives from Pets Best and NAVTA will select eight finalists from the submitted entries based on content and originality. The public will then have an opportunity to vote online for their favorite submissions through the Pets Best website, http://www.petsbest.com, and the agency’s Facebook page. The submission deadline is Sept. 12, and online voting will take place from Sept. 26 to Oct. 10. Veterinary technicians assist veterinarians in many aspects of treating animals. Working in environments such as private veterinary practices and research facilities, veterinary technicians often perform highly technical tasks, including assisting with diagnostic, medical and surgical procedures, providing specialized nursing care and more. For more information about the Why I Love Being a Vet Tech contest, visit http://www.petsbest.com/blog/vet-tech-contest. Dr. Jack L. Stephens, president of Pets Best, founded pet insurance in the U.S. in 1981 with a mission to end euthanasia when pet owners couldn't afford veterinary treatment. Dr. Stephens went on to present the first U.S. pet insurance policy to famous television dog Lassie. Pets Best provides coverage for dogs and cats and is the only veterinarian-founded and operated pet insurance agency in the United States. Dr. Stephens leads the Pets Best team with his passion for quality pet care and his expert veterinary knowledge. He is always available to answer questions regarding veterinarian medicine, pet health and pet insurance. The Pets Best team is a group of pet lovers who strive to deliver quality customer service and value. Visit http://www.petsbest.com for more information.